My goodness, you’d think this was some sort of chocolate-covered blog. Oh wait; that’s right. It is. Recently, I’ve been having trouble locating Jocalats. 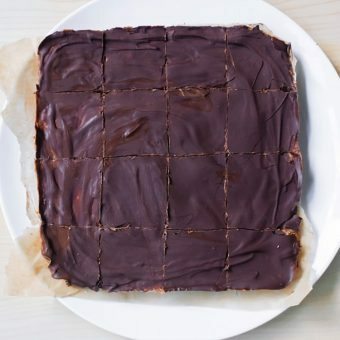 Thank goodness I know how to make my own chocolate Larabars. Plus, they’re cheaper than store-bought and save packaging too. Based on the recipe for Fudge Babies. Click for more flavors: Homemade Larabar Recipes. What are your favorite Larabar flavors? 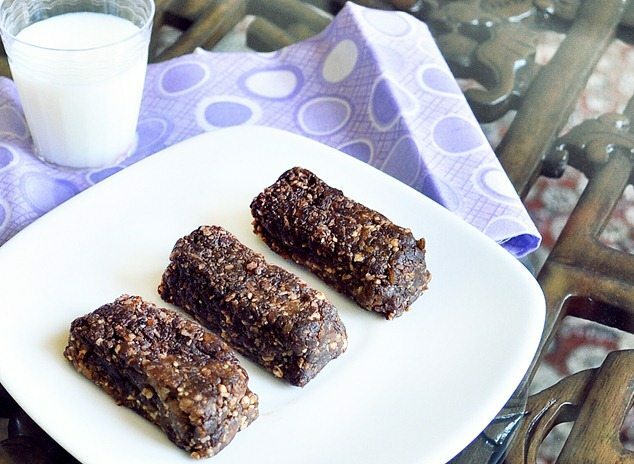 One of my favorite homemade larabar flavors: Homemade Oatmeal Cookie Larabars. As for the real Larabars, my favorite flavors are the plain chocolate Jocalats and the cookie dough Larabars. I love making up my own flavors and am thinking chocolate-raspberry might have to be next! 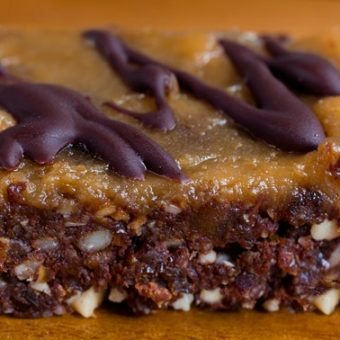 Any other flavor suggestions for homemade Larabar recipes you’d like to see? 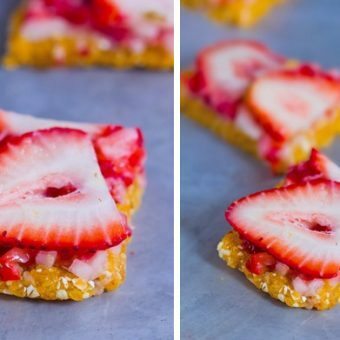 No Bake Strawberry Bars – Healthy Summer Snack! I want to eat these right now! And I kind of want to cover them in peanut butter! You took the words right out of my head! My favorite Larabar flavor is actually YOUR cashew cookie recipe! Seriuosly! It’s 10 times better than the packaged cashew cookie flavor. Anyone reading this, GO MAKE Katie’s cashew cookie larabars RIGHT AWAY!!!! Its my favorite too…and my husbands! Oh no trouble!! THANK YOU! These look delicious! 😀 What brand of cocoa powder do you normally use? And my favorite Larabar is the chocolate chip peanut butter cookie. BIG SURPRISE, I know! I, too, love Larabars! My first one ever was the apple one, and that’s actually still my favourite one, even after trying most of the rest (excluding the coconut ones). I love warming them up a little bit… They taste like fresh-from-the-oven cookies that way, in my opinion. I’ll eat dairy-free vanilla ice cream with a warmed apple-flavoured Larabar as a special treat, sometimes. It’s like eating apple pie, I swear. 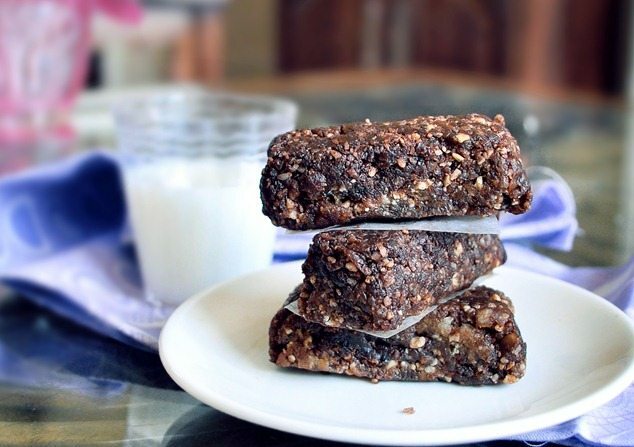 Making your own Larabars–SUCH a good idea! I can only imagine it would save a ton of money, which I’m all about these days. I actually saw on Barefoot Contessa the other day that she makes her own vanilla extract, a giant jar at a time, and apparently it keeps indefinitely. I’m definitely going to start doing that too! Also, the Ginger Snap Larabars are one of my faves. I bet they’d be easy to make! I can’t wait to try this! I like the Ginger Snap and Apple Pie Larabars. Some people have used raisins… I can’t personally vouch for that, though. But it could be fun to experiment. Or maybe prunes? I love Larabars soo much, but wish the Jocalat flavours were available in Canada! They’re also a bit more expensive, and don’t keep me as full, as Clif bars, so I’ve been buying more Clif bars lately! 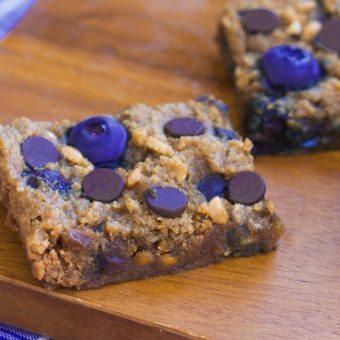 These homemade ones look awesome though – I prefer the non-chocolate Larabars, like apple pie and peanut butter cookie, but the peanut butter chocolate chip is pretty yummy too! Haha, OMG you did get a ton of comments on that post – but for real, it IS the best giveaway ever! 😉 I like the peanut butter cookie Larabars. These would be great to make a batch of with the school year starting soon, something to grab on those days where you need to run out the door. Do you know how long they keep for, or if they can be frozen? They keep for at least a week… or they CAN be frozen for months! I have never tried a Larabar because when I read the ingredients I think, “hey, I can do that myself”, and then put it back. 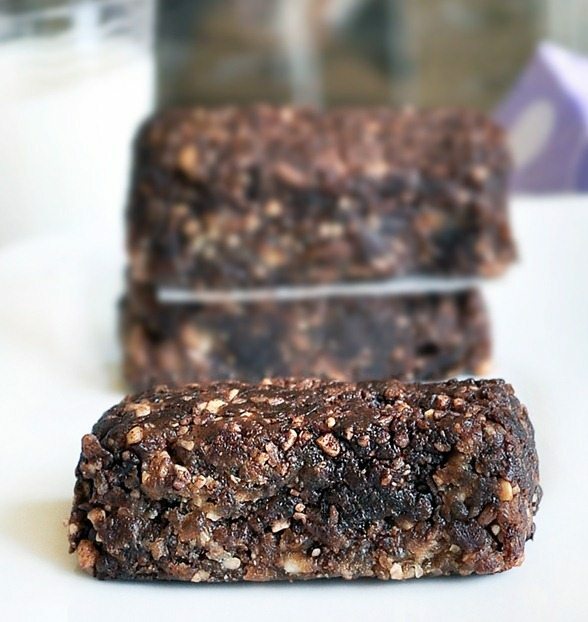 Plus, I’ve had these in the form of fudge babies and really don’t think a packaged bar could get any better than these homemade treats. I love these healthy treats and so do my friends. When I form the tasty morsels, I place the mixture between waxed paper and then I use a rolling pin to flatten out the bar. It compresses the ingredients so nicely and makes it very easy to form. I also refrigerate the flattened out shape until it is firm and then I cut it into pieces. What a great pick-me-up! I do like Larabars!! I think there a bit small and calorie dense for me to eat all the time, but some are quite tasty. I really like the cookie dough one, I think its my favorite 🙂 especially slightly warm, so the chocolate chips are gooey!! mmm! Your homemade Larabar recipes are dead-on, and sooooo much more affordable!